Why not book in advance online? The Fat Controller supervises Rev.W.Awdry's classic children's favourite - Thomas the Tank Engine on his ‘Day Out With Thomas™’ visits. At Christmas Thomas likes to take all his young friends to visit Father Christmas in his grotto. A wide range of souvenirs is available in the ‘Thomas’ shop. There is a Refreshment Room serving lunches, snacks and drinks also a picnic area where you can sit and watch the trains go by. Adult GWS members, including 60+, should book directly with the Railway Centre Office, as these tickets are not available on-line. Please book in advance online (Booking Fees apply). Bookings now open for December 2019. Thomas' last scheduled run to Father Christmas' grotto is at 3pm on each day of operation and you should arrive at the Railway Centre by 2:30pm to ensure you are on the platform in good time. 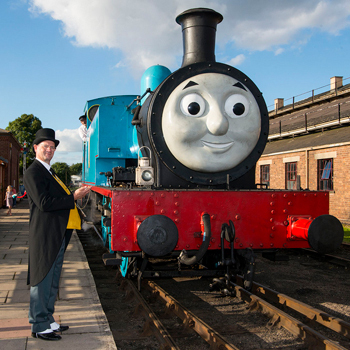 Dogs (except guide dogs and hearing dogs for the deaf) are not permitted at Day Out With Thomas days. Further Terms and Conditions regarding the event can be found on MATTEL website.